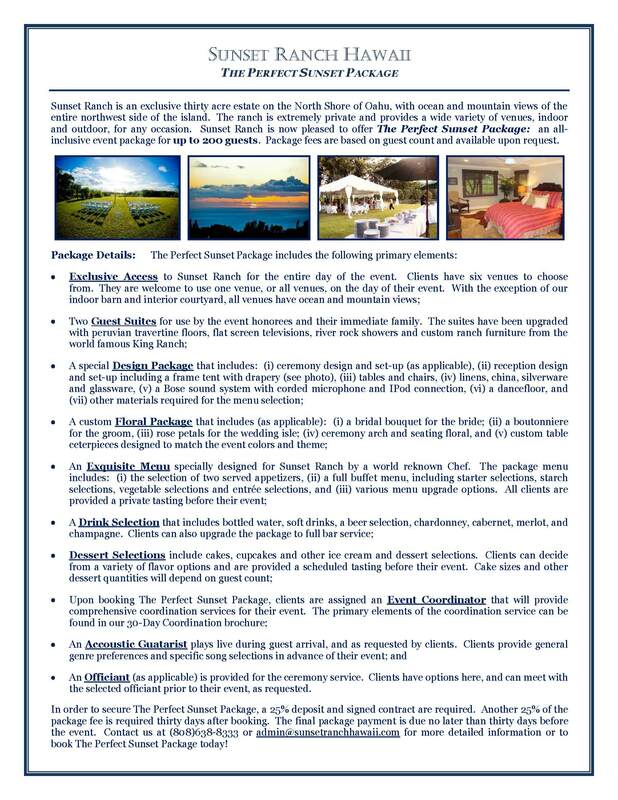 In an effort to continue to provide the best possible venue experience to our clients, Sunset Ranch is pleased to announce that we are now offering all-inclusive event packages: The Perfect Sunset! We take care of all event details so clients can focus on enjoying their special time at the ranch with family and friends. Our package offering includes, but is not limited to: (i) exclusive access to Sunset Ranch for the entire day, (ii) event coordination, (iii) all food and drink ($23 Menu), (iv) tent and materials design, set-up and take-down, and (v) entertainment. Additional packages details can be found in our brochure below. We can also work with you to arrange all transportation and overnight accommodation needs through our Preferred Vendors. You can find other brochures, including our Property Use Agreement under Brochures on our Event tab. The Perfect Sunset package pricing is based on guest count, and available upon request. We would absolutely love to host your event at Sunset Ranch! Please contact us at (808)638-8333 or [email protected] with any questions or if you would like additional details. Mahalo nui loa!